Lower down the school (in Key Stage One) a lot of poetry units use acrostics as a creative way of getting children to write- with the starting letter already waiting at the beginning of the next line. However, acrostics are still an effective way of either remembering something (much like a mnemonic) or as a way for children to develop their ideas for more challenging poetry in key stage 2. Children will go beyond using one word for each letter and will come up with whole lines, possibly even getting them to rhyme as well. These poems can be continually adapted and altered for different effects. The range and possibilities are endless. 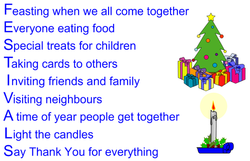 The typical acrostics are written for times of the year e.g. Christmas, Easter, Summer; for weather e.g. snowing, raining, sunny; and for their own or another person's name (some will insist on doing all four middle names and their surnames!) Again, there are an infinite number of words that can be used, but it is important that children are stretched to try and use lots of description, as well as consider the number of syllables they use for eah line. Will they use a rhyming pattern?